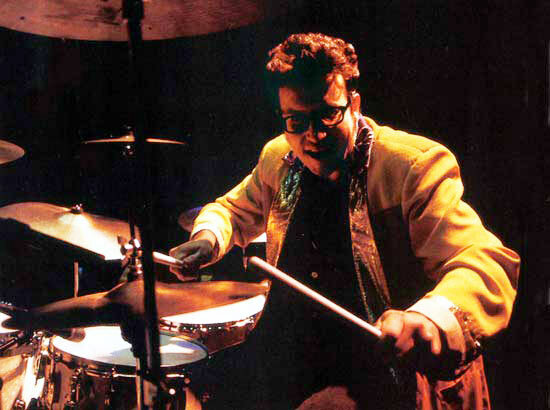 Widely recognized for his fifteen years with The Brian Setzer Orchestra, Bernie now does a variety of studio work that goes anywhere from the television shows like The Simpsons and Family Guy, to movies like Speed Racer, to the Blues-Rock of Carl Verheyen to the big band sound of Gordon Goodwin Big Phat Band to R&B icons like Chaka Khan and Patti LaBelle, and to his own band Bern. You can check out his credits and more at myspace.com/berniedresel and berniedresel.com. You can go here to read more book excerpts. I'm sure that everyone who watches television lately has seen the Heineken commercial called "The Entrance." One of the most catchy tunes you'll ever want to hear is the underscore for the commercial, a song by Asteroids Galaxy Tour called "Golden Age," which gets our song analysis for today. Go here to get the full 3 minute version of the commercial, rather than the usual 30 seconds, which makes the premise of the commercial make a whole lot more sense. The Asteroids Galaxy Tour is a Danish pop band consisting of vocalist Mette Lindberg and producer Lars Iversen, and "Golden Age" is from their first album called Fruit, released in 2009. As with all song analysis, we'll look at the song form, the arrangement, the sound and the production. The chord changes are the same for the verse, chorus and interlude, with only the melody changing, while the bridge is completely different. What's interesting is that the song ends on a bridge rather than an interlude, which is quite unusual. "Golden Age" is actually a fairly sparse arrangement, with just piano, bass and drums carrying most of the song. A horn section playing fills that outline the chords in the chorus, then enter again in the bridge playing a unison melody. Another interesting point in the arrangement is that the overdubbed piano lines change during each verse, which is the major difference between them. Depending upon the version of the song that you hear (the commercial is bit different from the album), you'll hear some differences. The drums are fairly trashy sounding, but work great here. The vocal in the chorus has a long timed delay that differentiates it from the verse. What makes this production so cool is how the sections build. The verses are very sparse, then the choruses are larger. Finally the bridge is even bigger sounding with synth arpeggios underneath the horn section and the entrance of a guitar. Yet the song breaths dynamically, with the last verse even sparser for the first half until the bass enters. That's always the sign of a great production - the song dynamics. Send me your suggestions for song analysis. 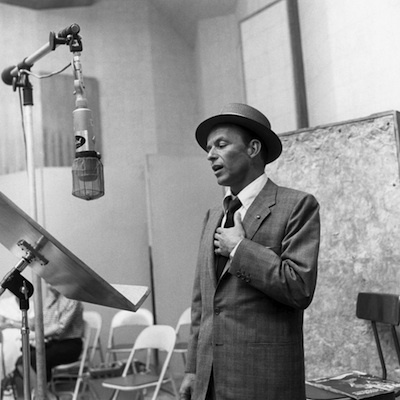 The most viewed post ever on this blog is the Inside Look at a Frank Sinatra Session. I'm not sure why that clip has garnered so much interest. Was it because the the historical content of the session? Was it because the stature of Sinatra? Was it because a bunch of audio geeks wanted a watch how our audio forefathers recorded in the past? Then came the following private email from Ed Fleishman, the director of piano studies at 5 Towns College, adjunct professor of education at Hofstra University and Queens College, and obviously someone who knows a little something about music. I've reprinted the contents of that email with his permission, and cleaned up the grammar a bit to make it easier to read. In it he provides his take on Sinatra. If you're a fan of the Chairman of the Board, you might be better off to stop reading now. "I have been a professional musician for over 75 years in NYC. I have two advanced degrees in music history and education. I've worked the ships, the clubs, the toilets....the works. I cannot believe the adulation accorded to Sinatra by people who should know better. "Scooby dooby do" is not phrasing. Adding notes and additional words other than those of the composer or lyricist does not make one an innovator. Clipping whole notes and shortening phrases for lack of breath does not make one a musical genius. Perverting artistic content in the name of a higher power [himself] does not augur well for a well-remembered future. The young Sinatra was wonderful, but not the old one. Do his adorers need a hero so badly as to extol talent that no longer existed in the name of hipness? It's like the Metheny/Kenny G. thing. A 90 year old Artie Shaw was being interviewed by Mark Simone on WINS. After a heated discussion on Sinatra's merits [much criciticised by Artie], Simone finally yelled..."Well, who do YOU think is a good musician?" Artie said "Beethoven's not bad." Simone became almost apoplectic. Great moment in radio. I was driving home from a gig and flipped out. I will end this diatribe with the following: Playing piano in a Greenwich Village loft some years ago for a fund raiser. The teenage daughter of the hostess asked me to play something classical. "Who is your favorite classical composer? ", I asked. "Frank Sinatra," came the reply. Same gig about an hour later: Beautiful blonde sits down next to me on the bench. I don't remember what tune I was playing. She says "I was Paul Desmond's mistress." I, the master of wit and repartee answered, "That's nice." The above email illustrates something that's been going on between musicians probably from the beginning of time. In every era there are artists who take their music extremely serious, and those that are very successful who appear not to. Today you'll find the same controversy surrounding the music of Justin Beiber, Lady Gaga, and Katy Perrry, to name a few. When The Beatles first broke, they were considered in the same light-weight category by the "serious" musicians of the day. I wonder who Beethoven considered a wanker? The reason why I liked this email so much was because there's a sort of rarefied atmosphere around Frank Sinatra, and Ed Fleishman was willing to pierce that and give us another perspective. Thanks, Ed! Way back when I was teaching recording I had a guy in my class who was really into after-market car audio who used to tell me about these contests where the SPL in the car would get as high as 140dB SPL plus. I doubted the guy, because that's louder than the Space Shuttle taking off, and that much level would blow out our ear drums in a flash. Forward a few years I happened to be at a trade show where they actually had one of these contests, and sure enough, the SPL was loud enough to break the windshield of the car! What I didn't account for is that no one would be crazy to sit inside the car during the contest. Here's a cute little video that shows exactly what happens when the pedal goes to the metal with a souped-up car stereo. Remember that this is absolutely nothing to do with audio quality; it's pure and simple audio level. One of the trademarks of clean SPL is that it doesn't sound loud, just bigger. Once you've heard a playback in that environment, it sticks with you forever. Here's a great interview with Neil Young and producer Daniel Lanois, where Neil describes the making of his new album. 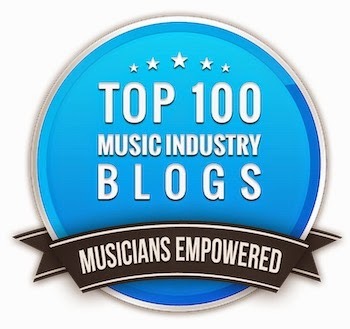 There are plenty of words of wisdom, but maybe the best one is, "They get technically better, but spiritually further from source," when describing musicians who practice so much that they lose sight of why they're doing it in the first place. The other cool thing is that Neil only did 2 takes for each song on the album. You gotta love someone who's so comfortable with himself as an artist to be able to do that.